Netbiter is a complete remote management solution that enables you to monitor and control remote installations online. Substantially reduced costs for service and better control of your equipment — benefits which will have effect on your business from day one. 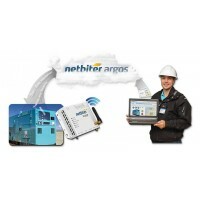 Netbiter Argos (www.netbiter.net) is a cloud-based data center where all data from your field equipment is securely accessed and stored. Depending on the Netbiter Service you select, you will have a host of remote management features available to present your equipment data.